Perth, Western Australia is a high growth city. With that comes a lot of activity in the building trades and unfortunately the interest of thieves. Many Perth tradespeople have had tools, trailers and other assets stolen. Often the loss of thousands of dollars of tools. This loss and desire not to have it repeated often prompts enquiries into our GPS vehicle trackers. For a tradesperson who often makes $2,000 or more a per week, the theft not only costs the insurance excess charge and the tradies time, but also loss in revenue from being “off-the-job”. The time required to go out and purchase a new trailer, have signage, doors, locks fitted and have replacement tools bought can often take weeks of downtime. Leaving a trailer outside, and not in a garage, is a big temptation for thieves, especially at night – perfect timing for a thief to steal the trailer and its valuable contents. With an installed GPS vehicle tracker the tradesperson can be immediately notified by SMS (and email) that their trailer has moved from it’s parked location. This will give the tradesperson time to possible prevent theft by chasing off the thieves, or recording them on video as evidence for police and then calling the police department to apprehend the thief and recover the stolen trailer. Even if the Perth tradie is not aware of the theft until hours after, they can still see it’s route using the GPS vehicle live tracking systems and ask Police to recover it – minimising the trailer loss and damage. Many insurance companies see the valuable benefits of GPS vehicle trackers in improving asset recovery that they will often provide policy discounts. The insurance companies know that if the vehicle, trailer and/or tools can be recovered it will reduce the amount of the claim and also reduce paperwork and administration costs in processing total loss claims. Whilst it’s impossible to entirely protect a trailer from theft, a GPS vehicle tracker fitted to the trailer will certainly ensure that if it is stolen, there is a good chance of stopping a theft quickly. 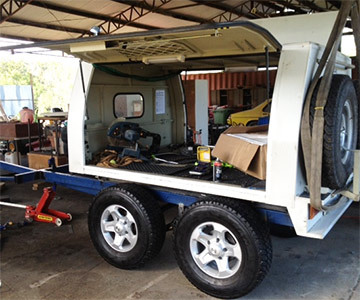 Recovering the trailer and the tools by police soon after the event will minimise disruption to the Perth tradie and allow them to get on with their work – and making an income. Even better, rather than thieves getting away with such activities, they will be caught preventing repeat of such behaviour and disruption to the livelihood of Perth tradespeople!